PALM BAY, Florida - The Palm Bay Police Department is requesting assistance with identifying a robbery suspect. At approximately 6:30 p.m. Sunday, September 17th, 2017, the suspect entered the Sunoco gas station located at 1210 Malabar Road SE in Palm Bay, Florida. 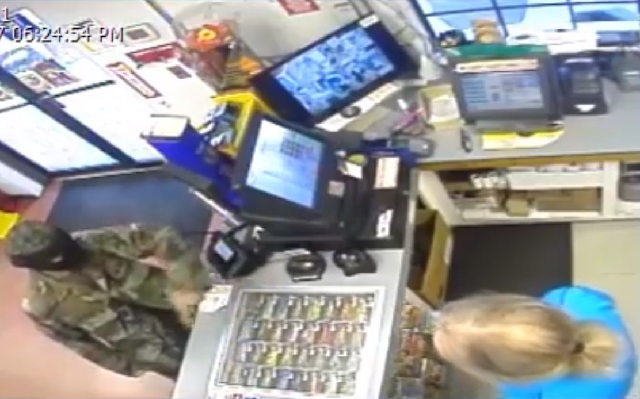 Police say that the suspect demanded the cashier to give him all the cash. The suspect was described as a white male approximately 5'8" 150 lbs., wearing a camouflage bandana with a black neoprene style half ski mask, a large green camouflage army style jacket, black or camouflage shorts and white tennis shoes with black socks. According to police, the suspect he also kept his right hand inside his jacket implying he had a firearm during the robbery. Anyone with information is asked to call CRIMELINE at 1-800-423-TIPS or CRIMELINE.ORG.